Chubbuck is located at (42.921648, -112.467416), at an elevation of 4,472 feet (1,363 m) above sea level. In the city, the population was spread out with 33.9% under the age of 18, 10.5% from 18 to 24, 27.6% from 25 to 44, 19.3% from 45 to 64, and 8.7% who were 65 years of age or older. The median age was 29 years. For every 100 females there were 97.6 males. For every 100 females age 18 and over, there were 93.4 males. 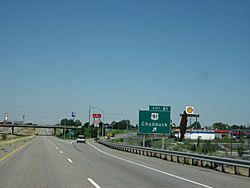 Chubbuck, Idaho Facts for Kids. Kiddle Encyclopedia.